Does your laptop get hot while using it ? There are a number of reasons laptops get hot while in use, if the laptop is an older model it could mean it’s prone to producing excess heat. As technology progresses, things like this get ironed out in newer models. Another reason could be applications or games which tax the system, playing the latest games will push your laptop to the limit as these are intensive on the graphics card and cpu. Other things like video editing, handling large files in photoshop can also stress the system. So before you start looking for a new model of laptop, why not try out a cooling pad? These are designed to provide active cooling solutions for your laptop which could make it run faster and prolong it’s life. Another reason to choose a cooling pad, is where you use your laptop – if you regular use it on your lap or propped up in bed, you will know the feeling of being overheated by your device. These cooling pads will also create a barrier between you and the heat, making operation more comfortable all round. We have studied what’s on the market currently and put together this complete guide – we have hand picked what we think are the top 10 devices and reviewed them with honest pros and cons of each item. At the end of the guide you will also find our buyer’s guide and FAQ to help you make up your mind. Best Overall – with one 200mm fan and the capacity to prevent sweaty palms, the Cooler Master NotePal X3 is a complete laptop cooling pad. Best Budget – with its 6 coolers, the Avantek Laptop Cooling Pad offers reliable functionality at a low price. Best Premium – suitable for most gamers, the Tree New Bee Cooling Pad offers 4 reliable low noise coolers. Best Value – the ThreeLeaf T102 is very affordable for its maximum 21Db noise level. 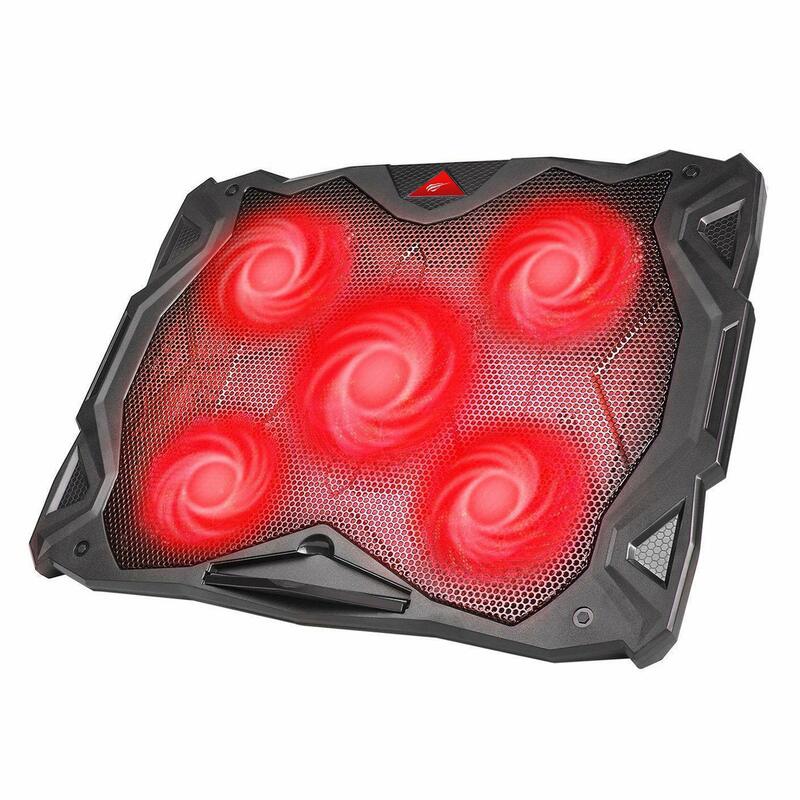 This laptop cooling pad is one of the few options which are also made to look cool. Its main purpose is to serve gaming laptops. But its design is not too limiting. This means laptops of 17” and 15” laptops can benefit from its cooling power. This cooling power mainly comes from the high-performance 200mm fan which sits directly in the center of the cooling pad. There is an aerodynamic principle used in the design of the laptop cooling pad. It means the air circulates with the minimum friction possible. The result of this design is a laptop which is up to 20% cooler when compared to using no cooling pad. The cooling fan can actually be seen easily as it sits close to a blue LED light. But the Cooler Master’s cooling pad also goes further with its quality. Unlike blocky cooling pads, it actually comes with top design. Made with glossy UV coating, the X3 is a solution for those who might also use it away from home. Of course, this does not take anything away from its adjustable cooling performance. Another interesting design characteristic comes with the help of the included breeze airflow which directs some of the air currents towards its front. The result is that the user actually don’t have to deal with the sweaty hands’ issue. Users who might be looking to play for hours might also feel encouraged by the design of the cooling pad which allows a proper posture at the desk with reducing pressure on the back. This impressive Havit design comes to meet the needs of most laptops, notebooks or ultrabooks of up to 17” in size. It is one of the most-polished laptop cooling pads which means it works well while offering a modern design. With a thin profile, the cooling pad is actually very mobile. It can easily slide in the laptop’s bag for traveling users. Most importantly, it does a good job with its cooling capacity. Based on 3 small coolers, it offers immediate cooling power. To start these coolers, users simply need to connect its cable to a USB 2.0 port. 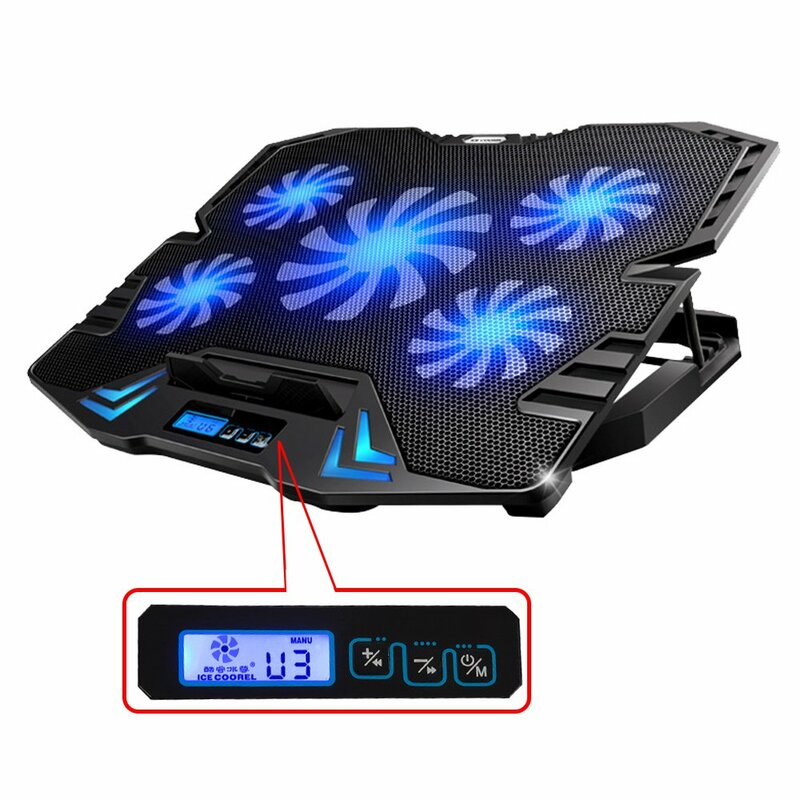 When the coolers are running, there are blue LED lights to signal their performance which can even make the cooling pad look more interesting. When it comes to ergonomics, not much can be done with the coolers inside the pad as they are not flexible. But with added support legs, the cooling pad can also be raised to two working positions. It is why the cooling pad can be one of the best options to minimize fatigue, back or neck pain which is usually associated with long hours of sitting. When it comes to the materials, many users are interested to see how they seem on paper and what they can expect as for durability. The Havit laptop cooling pad looks very good both on paper and in reality. Based on a durable ABS plastic frame, it actually comes as a lightweight design. This type of plastic is already familiar to gamers from other computer accessories. The coolers and the laptop are then separated by a modern-looking metal mesh. It maintains its shape even when the laptop is running for hours. This cool mesh look can even mean the laptop cooling pad can be used for various public events as it suits most laptops. But the main attraction of the laptop cooling pad remains its small coolers. At 110mm each, they can create an impressive cooling power together. It is why the extra cooling power can be suitable for gamers who have to deal with demanding 3D graphics for hours. At the same time, the laptop cooling pad also includes 2 USB ports which can be used for various purposes. Users can connect their smartphones or other mobile devices to these ports for battery charging purposes. But every laptop cooling pad can come with its drawbacks as well. Havit’s problem comes with small vibrations from the three fans, but this is not something to impact the overall user experience too much. As one of the affordable laptop cooling pads, TeckNet’s design is highly suitable for long term results. It comes with a fan speed of 1.200RPM and an airflow of 38.5CFM. Its noise levels are low at 15Db. 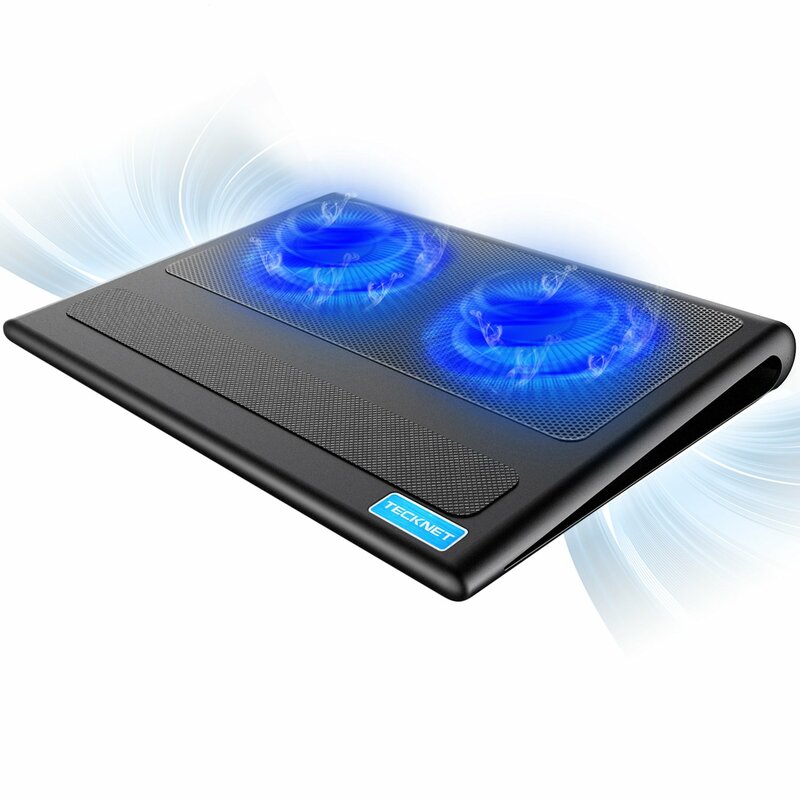 Most users can agree that the 2-fan laptop cooling pad is also one of the most attractive designs in its class. With a modern design, the cooling pad can be considered by simple home users or by professionals. With 2 fans of 110mm in diameter, the cooling pad is truly capable. It might not be as powerful as the 3-fan alternatives but one of its advantages is that it provides direct cooling to the edge of a laptop, which is where most heat is actually coming from. The portable nature of the laptop cooling pad is attractive for a number of users. It comes as a top solution to use in bed, where the reduced airflow can actually lead to laptop overheating. Since many users can actually use it in bed, the cooling pad might even be the best option when it comes to noise levels. Many people use laptops in bed next to their partners and this is one instance when lower noise levels can work to their best. When it comes to the actual position of the laptop, there are a few considerations to underline. The cooling pad comes with a standard angled laptop position which aims to improve visibility. But the surface of the cooling pad has also been made with extra care. It is this surface that actually comes with a combination of metal and rubber. Metal mesh is used for support and durability. The added rubber insertions are used to keep the laptop in place with sufficient grip, which is crucial in some angles, especially while lying in bed. Suitable for laptops up to 16”, the lightweight cooling pad is invaluable when traveling. Attending conferences, gaming events or any other types of travel involving the laptop can benefit from its extra cooling power. The good news is that using the cooling pad is not complicated based on its USB connectivity. With lateral air intake holes, the cooling pad can work on most surfaces. When it comes to extra functions, the cooling pad is on par with premium designs. It offers two extra USB ports. It even comes with an on/off switch which means it won’t need to be plugged and unplugged from the laptop all the time. However, one of the main limitations of this travel cooling pad comes with its size. Since it only fits laptops of up to 16”, the cooling pad may be better suited for a MacBook Air or similar laptops, which might be made with a compact size. As one of the few 4-cooler designs, the Tree New Bee is one of the most interesting cooling pads on the market. It immediately stands out with its unique design. 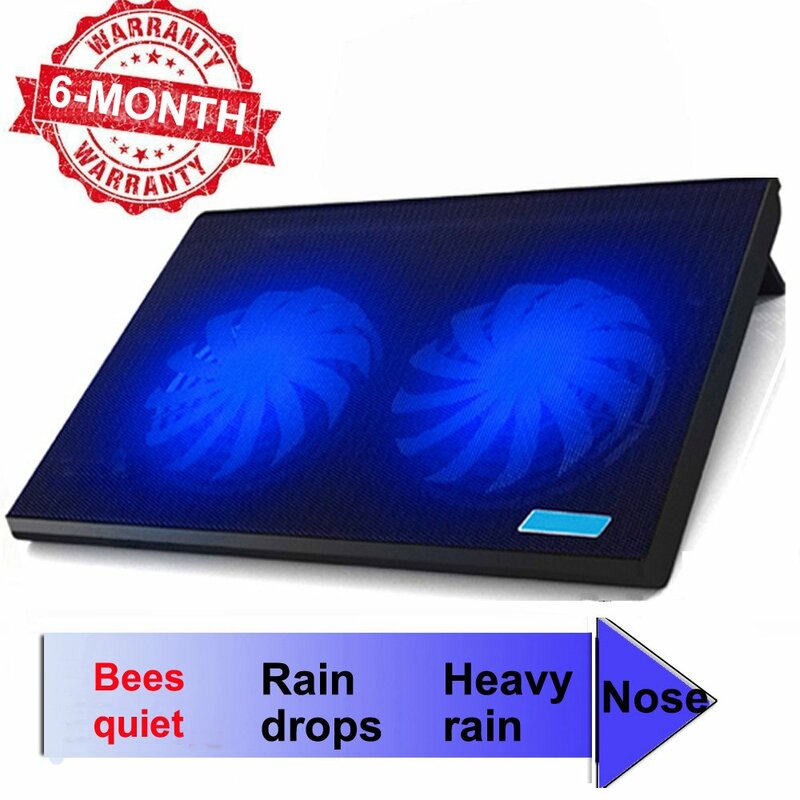 Somewhere between a bee-inspired or a butterfly-inspired aesthetics, the cooling pad comes with an air flow which can’t really be matched by many of its alternatives. The distinct coolers are placed in key points. This means that cooling the sides of the laptop is surely not going to be an issue. 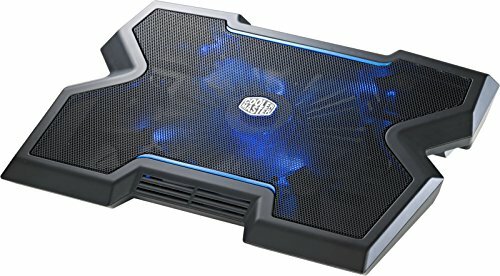 With a reduced emphasis on cooling the center point of the laptop, the cooling pad can actually come with impressive results for gamers or any other types of users who are demanding increased processing power from their computers. All these 3 fans come with included blue LED lights. It is why users can actually see them in action. Of course, they are safe as they are hidden behind a metal mesh surface. With a distinct mesh cover, this laptop cooling pad offers good stability for the laptop. It might not be the ultimate solution in terms of ergonomics but it certainly stands out with its 120mm fans which look impressive when working together. At 1.200RPM, these fans offer immediate ventilation through the metal mesh. In terms of performance, the 4 cooling fans offer a lower running temperature with an estimate of 20%. In most cases, this can even add to the durability of a gaming laptop. But the fans are placed in a way in which they can also serve another purpose. One of them comes with the actual orientation of the cooling pad. Users don’t need to feel trapped in the same position at the desk which can come with increased pain and stiffness in the upper back. The adjustable design of the laptop cooling pad is what actually makes it an interesting choice for added durability. 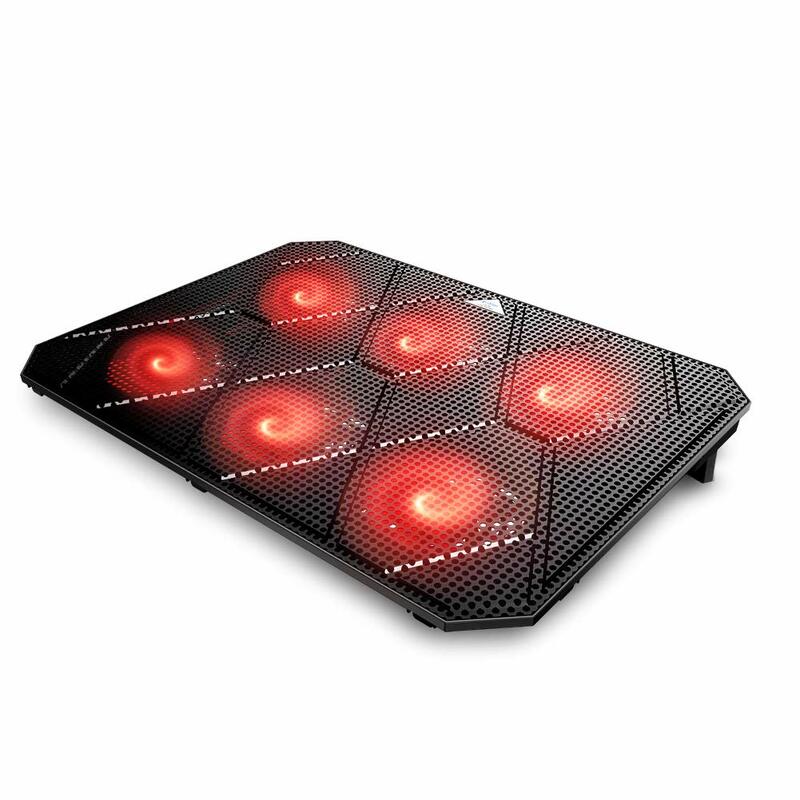 The height-adjustable cooling pad’s design means users can also take a break from the same position, remaining in a more relaxed gaming or working posture. Additional features include 2 USB charging ports situated at the side of the cooling pad. This allows some type of extra charging capacity for devices such as smartphones. But the entire concept of the cooling pad is actually based on USB connectivity. It is why it actually comes with USB connectivity for its power source as well. Suitable for laptops of 15” and 17”, the cooling pad is also versatile. While it can work with smaller or larger laptops, it is this diagonal range which actually ensures maximum cooling efficiency. But the cooling pad also has one small limitation. With no side vents, it actually traps air when situated on the bed with a laptop on it. It means the cooling pad is mainly recommended on a desk or table as this is where it will come with maximum cooling efficiency. As its name suggests, the laptop cooling pad actually comes with 5 fans. In one fan in each corner and a center fan, the cooling pad is one of the suitable options for proper airflow. Even if there are 5 coolers inside, they are not small by modern standards. At 110mm, they are actually at the same size as most fans used in modern cooling pads. As all Havit products, it actually comes with 5 cooling fans. It means the laptop is easily among the options to consider when it comes to cool aesthetics. In fact, the faster the fans rotate, the brighter the LED light becomes. The performance of the fans is also worth looking into. The center fan needs to cool with a bit less effort. It is why Havit actually chose a 1.000RPM fan for this position. The 4 cooling fans in the corner are actually much more powerful. At 1.500RPM, the coolers are among the most durable in their class. They offer real quality constant cooling where it’s needed the most. The construction of the laptop cooling pad is on par with the best releases of the category. Using a combination of ABS plastic, metal mesh, and rubber, it offers a durable design which can even be used by the most demanding gamers. ABS plastic is known for its durable profile. This plastic is made to maintain the shape of the cooling pad and avoid the situation where it could actually bend from the laptop’s pressure. With added rubber pads on the bottom, the cooling pad remains in place even on slippery surfaces such as desktops. Accessories include 2 USB ports. These ports can easily connect small devices to the cooling pad. However, they are not to be confused with ports for high power devices such as external hard drives. In terms of looks, these ports don’t take much from the futuristic aspect of the laptop cooling pad. With modern lines and an up to date design, it can also be the future-proof choice some users might look for. The durable plastic bottom and sides are combined with the elegant metal mesh top which makes the cooling pad an attractive product for those who are proud of their powerful laptops as well. At a weight of just 1.76lbs, the laptop cooling pad can be as mobile as needed. Gamers can take it with them while traveling away from home without too much effort. Of course, the cooling pad has a popular limitation as many users can attest. It LED lights can’t be switched off. This might be a small issue for some users. Others find the lights distracting in a dark room. But some users even show that their laptops completely cover the lights which might make this issue go away easier than expected. However, the 5 coolers might not be the most silent group in their class. At 40Db, they are not the loudest either. But the coolers can add to the overall noise level of a room in certain scenarios. As one of the most complex laptop cooling pads, the TopMate is one of the leading options for many users. As its name suggests, it is actually suited for gamers who will appreciate its features at their full capacity. One of the most important aspects to consider is fan performance. 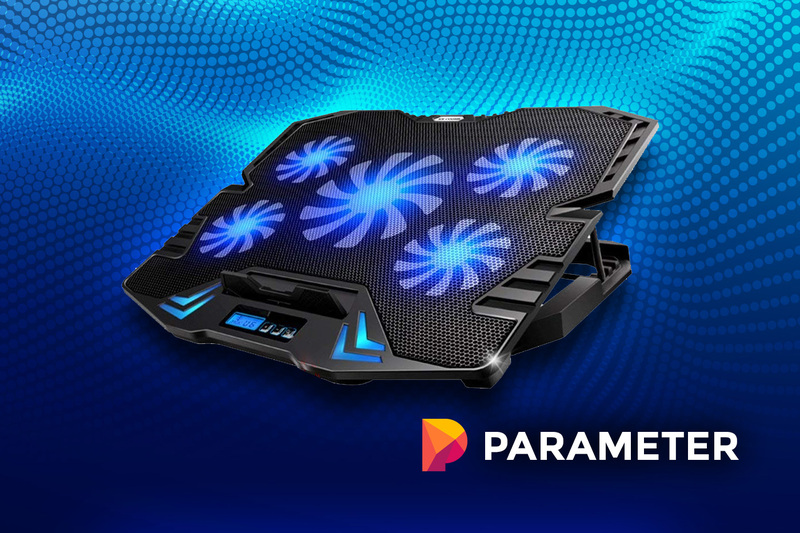 If most cooling pads come with a reduced-capacity fan in the center, TopMate has a different approach and it uses its most powerful fan in the center. It is why the manufacturer added an impressive 2.500RPM fan in the center of the cooling pad. 4 additional 120mm coolers are added as well. These coolers make the gaming pad one of the most powerful in its class, without asking for much more than many of its alternatives. With an integrated digital display, the cooling pad is among the most interesting designs to consider. This display is actually situated close to the controls of the fans. Users can see the speed of the fans and adjust it higher or lower as needed. Even more, they can ensure they always offer the best solution when it comes to the type of activity they have on the laptop. Lightweight software doesn’t require as much cooling capacity as modern games. The good news is that this integrated digital display can be viewed easily from most angles. There are 5 angles in which the laptop cooling pad can be set. It makes it ideal when working at the desk but maybe better suited when playing a quick game in bed where display viewing angles can suffer. If the fans are highly capable, the same can be said about the other features. For example, the USB power cable is one of the longest in its class. At 75cm, it certainly allows for plenty of freedom of movement when the laptop is adjusted on the cooling pad. The materials are also selected according to what modern users want. Plastic and metal mesh materials are the choice of the manufacturer. These materials are recommended for their overall durability. Using the cooling pad is even more interesting than its characteristic. It is actually made with intuitive controls. All of them are detailed in its instructions manual. But an example of how the control works come with fan control. A short press on the button starts the fans while a long press on the buttons allows users to select between the various cooling modes. 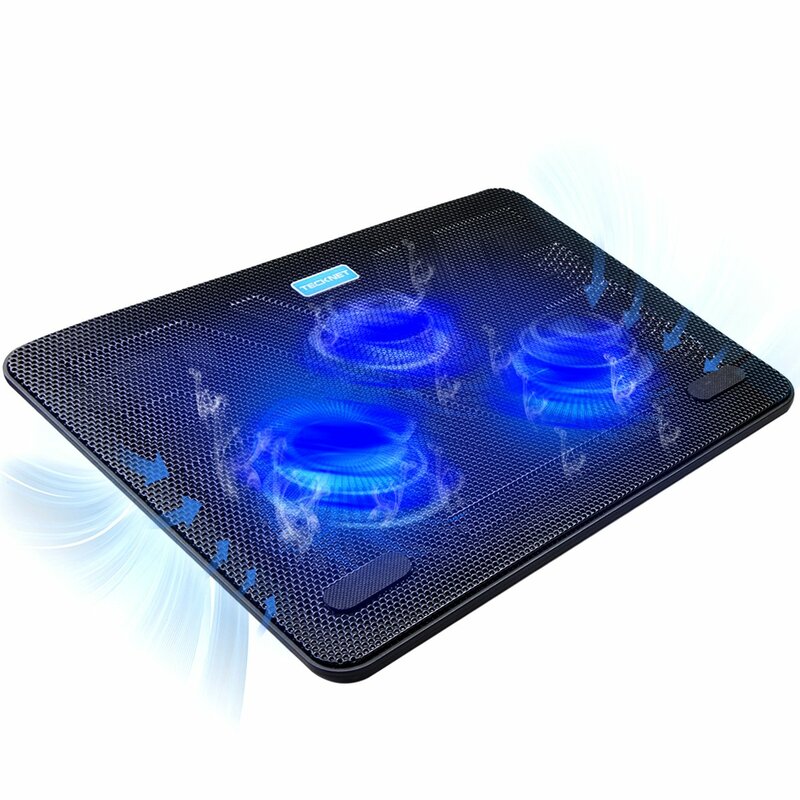 As a quiet performer, this laptop cooling pad is perfect for families with children. Even running at all times will not disturb the kids while there are sleeping. Its measured noise level is of only 21Dba which make it one of the distinct options when it comes to the way users perceive it. This reduced noise level is also advisable in various situations where there are two or more laptops in a room and where the noise can actually increase exponentially. Based on two 6” fans, the cooler comes with 1.200RPM per minute. Since there are only two coolers, it is why the pad actually manages to keep overall noise levels quite low. But this is also why the laptop cooling pad is mainly recommended for office work. There are no additional coolers to count on and gamers might need to look elsewhere as a result. This is why the laptop cooling pad supports laptops of up to 15.6”. Running the cooling pad does not require too much effort. Users simply plug its USB cable into the laptop which offers enough energy transfer to power the coolers. This cable is actually tucked on the back of the cooling pad and sits out of the way when not in use. During travel, the cable will not dangle in the laptop’s bag. But its design is useful as well. Since most laptops used on the cooling pad will actually be work laptops, the manufacturer expects a lot of typing. This can be the case with work e-mails, presentations or any other projects which require users to type a lot. This is why its ergonomic design comes with a comfortable typing angle which reduces the pressure on the wrists. The laptop cooling pad is a mature product which works well for it’s designed to do. It is why the manufacturer even offers a 30-day money-back guarantee on all purchases. TeckNet is one of the most respected manufacturers in the world of laptop cooling pads. Its 3-fan design rises to the high standards fans of the manufacturer expected. The 3 fans come with a 118mm design which is suitable for any type of laptop. Since 17” laptops fit the cooling pad, even gamers can consider it for lower running temperatures. Demanding graphics and technologies used in gaming can benefit from a slightly lower running temperature which prevents overheating. 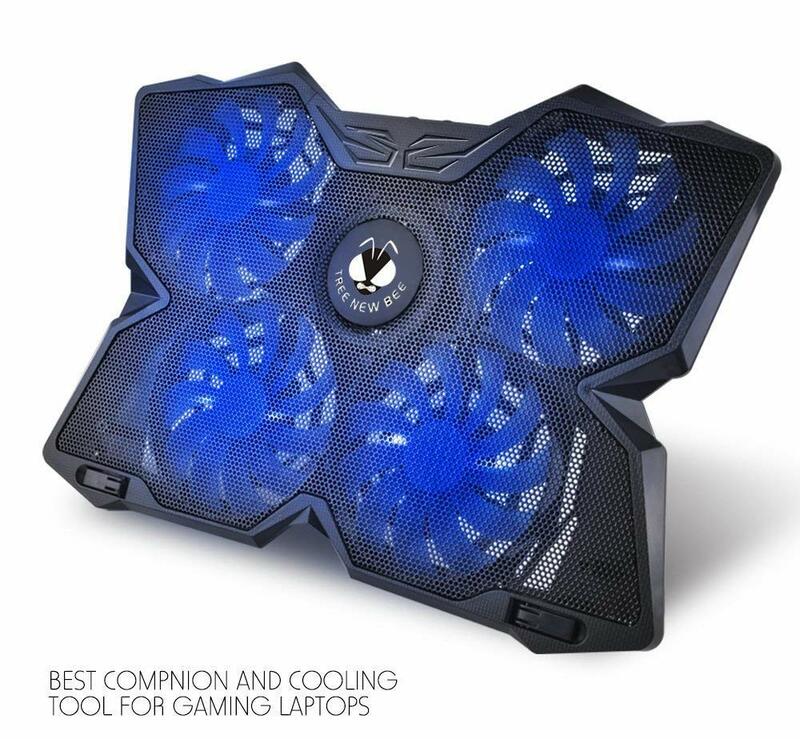 When playing any game, users can actually tilt the laptop cooling pad to improve their comfort. It is why they are able to find the best position to play demanding action games or any other online games with reduced wrist pressure. It is known that gamers spend many hours at a laptop and this is why this design characteristic is more important than expected. The materials used to make the laptop cooling pad are similar to what TeckNet has been considering in other designs. They include the aesthetic metal mesh top which is the surface that supports even the heaviest gaming laptop. Most importantly, gamers can rest assured that the materials do a good job in time as well as they won’t lose their shape due to extra heat. The three 1.200RPM fans ensure good airflow to keep the materials from overheating. An interesting characteristic to consider comes with the actual low noise levels. For a 3-fan design, offers a noise level of only 20Db can be quite surprising for many users. It is why the laptop cooling pad can even be seen as a worthy upgrade for gamers who want a bit less noise in their home. Having 6 fans on a laptop cooling pad seems unimaginable. But Avantek has proved this is possible and as a result, the company has raised the attention of gamers. 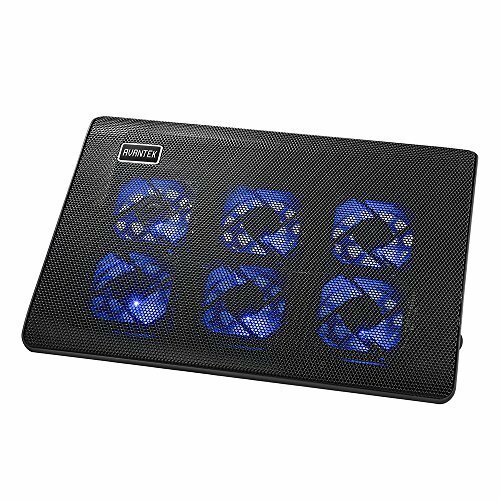 Arguably one of the best-looking laptop cooling pads, Avantek design also comes with the advantage of adjustability. The cooling fans have 6 operating speeds which are set by the user, according to the laptop’s requirements. Of course, this means that the noise level doesn’t have to be the highest at all times. As expected, the cooling performance of the product is impressive. The 6 coolers do a great job at sending cool air from the bottom of the cooling pad to the laptop. These coolers work with a familiar capacity of 1.100RPM. But the most important aspect is that their combined power is not needed at all times. Lower cooling speed can be used during studying. Reading and writing on the laptop doesn’t require as much cooling power. Watching movies on the laptop can benefit from one of the intermediary speed settings while playing games can benefit from the full power of the cooling fans. Of course, the quality of the materials matches the performance of the fans. The large metal mesh on the surface actually does a great job at dissipating heat as quickly as possible form the bottom of the laptop. It also draws attention towards the design of the laptop cooling pad. Apart from offering a viable option for any modern desk, it actually offers one of the thinnest cooling pads on the market. With a thickness of just 19mm, the laptop cooling pad is ready for action as soon as it’s out of the travel bag. 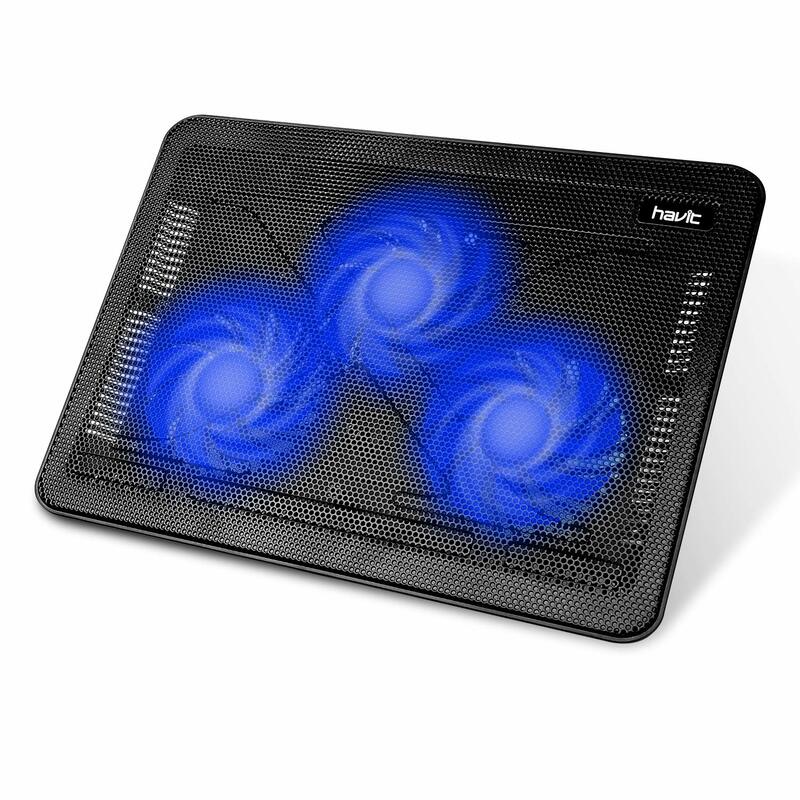 With 5 fans, the laptop cooling pad from Pccooler suits laptops between 12 and 17.3”. It is also one of the products which offer premium materials. An example of premium materials includes the stainless steel mesh top which is quick to cool. There are 5 fans who power the laptop cooling process. Most of them are small compared to what the most powerful options offer, but they work very well together. 4 fans of 85mm work together with a larger central fan of 110mm. But even if these fans are smaller, they work faster at 1.400RPM which won’t make gamers feel they are missing out on performance. Most importantly, the smaller profile of the fans means the laptop cooling pad is low noise. At 23Db, it is among the optimum products for noise control. Secondary features include 10 red LED lights. These lights immediately improve the visibility of the fans. Gamers can also select one of the 6 height positions to play as well as they would hope for with no wrist pressure. In the end, the laptop cooling pad can come with a custom performance. Not all laptops need the full speed of the fans. It is why users actually select the type of speed suitable for their needs. If some games are less demanding, others require the full action of the graphics card and of the laptop’s fan. It is why having the ability to set the right cooling speed can improve the performance of the laptop and it can also minimize noise levels. Most importantly, these fans can actually prolong the life of gaming laptops, which are not known for being too cheap. Apart from having a look at attractive designs, users should also be aware of the different laptop cooling pads on offer. Some of the best laptop cooling pads actually come with a long list of characteristics. But the fans themselves are the most important, followed by their positioning which should be based on maximum air circulation towards the hottest areas of the laptop. Gaming laptops vs. office laptop – A good starting point for an informed decision comes by seeking a suitable laptop cooling pad. A gaming laptop needs maximum cooling capacity. A work laptop might only need a compact cooling pad as it doesn’t deal with constant high temperatures as much. Cooler numbers and positioning – From 2 to 6 coolers, the products above offer different types of cooling capacity. Apart from checking the number of coolers, users should also be aware of their size and of their RPM performance. Most importantly, their combined results are the final determining factor in the cooling process. Thickness and mobility – The bulkiness of a laptop cooling pad determines its mobility. It is only when users find the thinnest cooling pads that they truly appreciate their mobility. On the other hand, gaming laptops are not mobile. They are thick and heavy and many of them might not even leave the house. Noise level – Up to 80Db, laptop cooling pads can come with different noise levels. Unfortunately, most users only realize just how important noise levels are when they are using the cooling pads at full capacity. It is often wise to invest in a low noise performer. Expected cooling results – Another important aspect comes with temperature control. Many gaming laptops include software which monitors the CPU temperature. From this point onwards, users can determine the cooling capacity they need. Even the best laptop cooling pads offer a maximum of 20% in lower temperature performance. Furthermore, some cooling pads can even be far from this percentage. It is recommended to choose the larger fans which are situated close to the hottest point of the laptop for the ultimate cooling capacity. Do gaming laptops need cooling pads? All gaming laptops have their own coolers on the processor and possibly on the graphics card. They do not need an additional laptop cooling pad. However, users can increase the durability of these laptops by keeping them cooler. Is a laptop cooling pad useful for office laptops? Some laptop cooling pads come with a reduced capacity. They are suitable for office laptops or smaller laptops. Even these laptops can benefit from the lower running temperature, especially if they are used for long hours every day. How many coolers should a laptop cooling pad have? From 2 to 6 fans, laptop cooling pads come with different designs and capacities. The number of fans is at least as important as their actual capacity and positioning. The way they circulate air is different but the final results can be similar. Do I need a separate wall plug for a laptop cooling pad? Some of the best laptop cooling pads connect via a USB port. This is enough to offer them power for the coolers. Will a laptop cooling pad’s noise wake up my child? Most laptop cooling pads are loud. It is wise to choose a product with up to 24Db if the laptop is going to be used in a room with a sleeping child. Can I use a laptop cooling pad in the bed? A laptop cooling pad should be usable on the bed. However, air flow should remain unrestricted for optimum cooling capacity. Counting the number of coolers is a good first step to choose a top cooling pad. But a laptop cooling pad now comes with so many extras to consider that new buyers can be confused. From extra USB ports to included LED lights, the number of extra features can be important for the user experience. Most importantly, limiting features such as the length of the USB cable or the inability to switch the LED lights off are often underlined as common problems. Other possible issues include a slippery surface, especially when the laptop is placed at an angle. Another common issue comes with the noise levels which can’t really be improved by the user unless the speed of the fans is turned down. Some of the best laptop cooling pads are able to cool laptops of different sizes. An unwritten rule states that cooling pads are suited for laptops between 12” and 17.4”. But those with large laptops know this is not always the case. Multiple cooling pads are actually able to only fit laptops of up to 16”. This is a characteristic which users need to look at in detail. But regardless of the laptop cooling pad of choice, it is advisable to actually check the temperature of the laptop and see if the product actually cools it. This might actually be a money-saving action in time, as cooler laptops tend to last longer. Bought one from our list? Leave your review below to help others out….